16mm Masonry Drill Bit + 6mm Allen key- £11.95. NEW- Built In Lugs x 4- £18.99. Sold Secure Motorscooter/Bicycle “ SILVER “ approved product. This product covers the code for sustainable new homes “ ENE 8” issue ID for cycle storage in new build & Housing association properties. NOW Sold Secure Domestic – Silver approved. Flush fitting base socket – Ideal to ride/drive over. NOW Sold Secure Domestic- Silver approved. Flush fitting base socket- Ideal to ride/drive over. Replacement fixing kit for all our Garage Defenders. Hardened 11mm chrome Molybdenum steel closed U shackle. Purchase these new Built In Lugs to transform any of our bolt down anchors into a Built in application for setting into concrete. 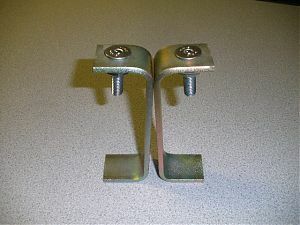 Two zinc plated lugs with two security screws. Just add to any of our bolt down Anchors- ready to set straight into your wet concrete. Ideal for new build garage bases etc or where no solid concrete is present. Phone for outside UK price. Products subject to availability, Prices Subject to change, E&OE. © 2002- 2009 PJB Security Products. All rights reserved.